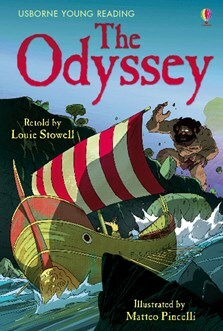 A retelling of Homer’s ‘Odyssey’ written for children who are fully confident readers. Odysseus is finally heading home after a long war, but his troubles have just begun. Terrible dangers are in store for the hero, from one-eyed monsters to cannibal kings. Part of the Usborne Reading Programme developed with reading experts from Roehampton University. I love Greek mythology and l love the gods too! Especially Athena she's my favorite.